There has been a loud outcry in the wake of President Obama's recent comments about star Philadelphia Eagles quarterback Michael Vick's post-prison second chance, with protesters falling primarily into one of two camps. They're either shouting, "He's only getting a second chance because he can play football!" Or they're bellowing, "He doesn't deserve a second chance because he's a dog killer!" The first argument might be true, but it just proves how difficult life can be for convicted felons trying to re-enter society. The second argument suggests that after prison, a convicted felon's "debt to society" should accrue like interest on a credit card that's never paid off. Critics fail to realize — or don't care — that the issue is larger than Vick, whose extraordinary athleticism virtually guaranteed him another shot at success after jail. The real conversations that Obama's comments should spark have nothing to do with former quarterbacks and everything to do with former prisoners. The media frenzy started after Obama called Eagles owner Jeffrey Lurie to have a conversation — according to a White House statement released Dec. 27 (in response to the firestorm) — about "plans for the use of alternative energy at Lincoln Financial Field, during which they spoke about that and other issues." The statement was issued after reports turned up that Obama had called Lurie to praise the Eagles for giving Vick an opportunity to play after his release from prison. According to Peter King of Sports Illustrated and NBC, Lurie said the president was "passionate" about the fact that "it's never a level playing field for prisoners when they get out of jail. And he was happy that we did something on such a national stage that showed our faith in giving someone a second chance after such a major downfall." Apparently some folks believe that every tongue should curse and every heart should hate at the mention of Michael Vick's name. Fox News analyst Tucker Carlson went as far to say that Vick "should have been executed" for dogfighting crimes, for which he spent 18 months in federal prison. "He went to jail for two years. I mean, whatever," Carlson said. "I think the president should be quiet on this one." Bill Smith, the founder of an animal shelter near Philadelphia, downplayed the lifeline Lurie extended to Vick. "This isn't about giving anyone a second chance," Smith told the Los Angeles Times. "It's about who can make the Eagles organization more money." Washington Post columnist Richard Cohen also questioned Lurie's motives. "It helps, I think, that Vick has completed 63.2 percent of his NFL passes and has 20 touchdowns," Cohen wrote. "He is not your average felon." Cohen went on to recount the grisly details of Vick's offenses, concluding that "he's a thug." Of course the Eagles' interest was fueled by Vick's rocket arm and fancy feet. If not Lurie, another owner would have rolled the dice in hopes of coming up with a potential league MVP. 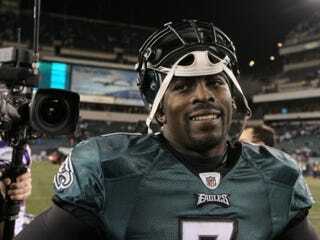 The bigger question is, would anyone have hired Vick for a job if he weren't an amazing athlete? Many of us know siblings, uncles or best friends' cousins who run into dead ends on job interviews once their criminal records arise. The ripple effect on mothers and children, as well as cities with high rates of incarceration, is staggering: Family income is 15 percent lower the year after a father is released, compared with the year before he went away. And the recession has only exacerbated matters. So instead of defending his praise for Lurie and Vick, Obama should be defending the "Second Chance Act" and calling for more employers to hire former prisoners. That could lead to more success stories from "average felons" like Timothy Gallagher, one of nine ex-offenders who were pardoned by Obama because of their exemplary work after they were convicted. Gallagher, who served time for a 1982 drug conviction, eventually returned to the Phoenix Fire Department and rescued two people in a memorable blaze. "All of this wouldn't have been possible without a second chance," he told the National Journal. Should the fire department be criticized for rehiring Gallagher because he's a good firefighter? Should McDonald's or Burger King be criticized for hiring an ex-offender because he's a good flipper? Should former convicts be relegated to certain jobs — if any at all — involving the most menial tasks? Yes, Vick is a remarkable athlete who did horrible things to dogs. But he deserved another chance to redeem himself regardless of his ability to play football. Any convict who serves his time and embarks on the path of rehabilitation deserves as much. As a society, we're shooting ourselves in the foot when we don't help the process along.